Just imagine how nice would it be to have a twin or a doppelganger (one that others didn’t know of) to send on family dinners, enter exams or other things I would somehow come up with. But we’re talking about a nice twin here, not the kind that would want to eliminate me and get all the fun. God no! Or having a twin sibling like Marcus Williams here who stood in for his brother, Malcolm, in high school picture day, and guess what? No one even noticed. Yup. That’s what I was talking about. Back in high school, Marcus didn’t feel quite well and his twin brother, Malcolm, decided to make sure his brother made it to the yearbook. And because they’re basically the same person, with identical features, Marcus got the job done and his brother didn’t even have to lift a finger. Did you guys go over how you were going to pose for the picture? It took people quite a while to find out they weren’t the same person. You might have fooled us, but you definitely wouldn’t have fooled Sherlock Holmes. Their post that went viral with over 250,000 likes and more than 61,000 retweets, inspired other siblings to share their “twin snap” stories. But the best story was probably of this one fella who worked with a guy and who would send his twin to work whenever he was hungover. This is hilarious to me. I use to work with a twin that literally use to send his twin to work when he was hungover. The twin that came to work use to be like I don’t feel good today that’s why I’m acting like this 藍藍藍藍. We found 3 years later that was happening. Soon after, people shared plenty of stories that made us even more envious of the twin life. I mean, who wouldn’t do it?! And others thought it was a good opportunity to try out their little experiment. There’s a psychological experiment waiting to happen here. Just show this picture, then ask: Which brother do you trust more? Which are you more attracted to? Which is smarter? 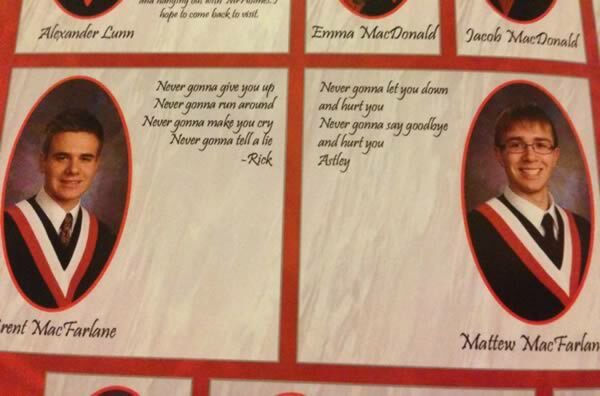 Fortunately for us, school yearbooks are full of siblings trying to pull off something fun. Drake and Josh fans over here. How I Met Your Mother fans are shaking. Wait, are they the same person?! Yeah, still weeping I don’t have a doppelganger.